With Google’s employee shuttle buses causing so much fury among some residents of San Francisco recently, perhaps we shouldn’t be too surprised to learn that the Web giant has now taken to water to ferry its workers to the office. 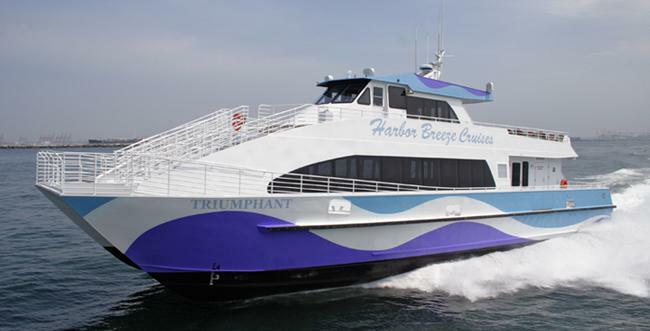 CBS affiliate KPIX 5 got hold of the story Tuesday, revealing Google has done a deal with a private firm to transport around 150 of its workers between San Francisco and Redwood City on a catamaran called The Triumphant (below). Redwood City is about 10 miles from Google’s Mountain View campus in Silicon Valley, so presumably buses will still form part of the commute. The new service kicked off on Monday, on a trial basis, and currently makes two trips in the morning and two in the afternoon. It sounds pretty comfy, too: “The vessel is complemented with stadium-style cushioned seating on the fore deck, upper deck perimeter seating, and aft upper deck seating near the outdoor bar.” The upper deck Captain’s VIP Lounge features “Beurteaux lounge seating,” which sounds perfect for Larry and Sergey should they ever hop aboard. Tech-company shuttle buses taking workers from the city to Silicon Valley have been in the news quite a bit recently, with some local residents blocking their path in protests designed to draw attention to concerns that the vast wealth created by the firms is failing to find its way back into the local community. Critics say that well-heeled techies in the city are pushing up house prices and living costs, making the city too pricey for long-time residents. The buses, operated by the likes of Google, Apple, and Facebook, are reportedly lavish affairs, with air conditioning, plush seating, and Wi-Fi guaranteeing a relaxing journey to work. The services have been using public bus stops for free, but just this week it was announced the tech firms will start paying the city for their use. Although Google said in a statement Tuesday that it doesn’t want to cause any inconvenience to San Francisco residents and that it’s looking at alternative ways to get its employees to work, we’re not sure if plopping a few Googlers onto a high-speed ferry will do much to assuage the anger of local protestors.